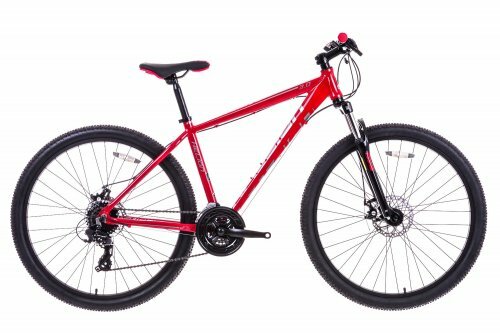 We're proud to introduce the 27.5" wheel Helion 3.0 packed with high level specification and features, it's ready for anything - so what are you waiting for? The Helion's hydroformed aluminium frame is designed to be lightweight but strong - the perfect compromise between speed and reliability. A more sporty riding geometry has been tailored specifically to help you travel at speed and the lightweight aluminium A-head handlebars provide strength making them more robust. The rowdy red and black colourway is highlighted by the addition of colour coordinated components and contrasting white and silver decals which are all sealed under a protective lacquer to keep them looking pristine no matter where your adventures take you. Modern 27.5" wheels help you to pick up speed fast with their increased diameter and low profile micro block tyres offer exceptionally low levels of rolling resistance to make pedalling easier. What's more, the tyres micro block grip is versatile, providing good traction on both compact and loose terrain. The Helion 3.0 also features a quick release front wheel axel to help you easily transport it to and from your favourite trails. A cassette free hub is featured on the rear wheel making it lighter, stronger and more reliable as well as providing a smoother gear change. Complete with an impressive span of 24 gears from the Shimano TX800 range the Helion 3.0 is sure to tackle the trails with ease. Plus the Suntour front suspension fork with 60mm travel has been designed from lightweight aluminium and plated in chrome to eliminate friction and provide a smooth rising experience when travelling over rough ground. Tektro mechanical disk brakes grant exceptional power stopping even in the wettest weather conditions.